In an ideal world, we’d see smartphone manufacturers increasing the battery size on their flagships each year. That doesn’t happen, and while batteries do sometimes get bigger on newer flagships compared to their predecessors, it’s not something that happens as often as we’d like. Samsung’s been guilty of it a few times: The Galaxy S8+ has a smaller battery than the Galaxy S7 edge, and the difference in battery capacity is even higher between the Galaxy Note 8 and the ill-fated Galaxy Note 7. The Galaxy S6, of course, took the cake back in 2015 with its abysmal 2,550 mAh battery, a substantial 350 mAh less than the Galaxy S5. A 3,200 mAh battery for the Galaxy S9? There’s no telling how the Galaxy S9 will compare to the Galaxy S8, although recently revealed dimensions of the device suggest the phone will be thicker and, therefore, technically have more space for a larger battery. We’ve already speculated as much, and today, a new leak says the Galaxy S9 indeed has higher battery capacity than the S8. The information reportedly comes from someone in possession of a test unit, but we’re not entirely sure, as the source is in Chinese and Google doesn’t do a great job of translating things to a form of English that would be easy to make sense of. The same source also suggests the S9 will support Quick Charge 3.0, which, frankly, would not impress us considering how it should have arrived on Samsung devices a long time ago. Should the Galaxy S9 have a 3,200 mAh battery, one would hope the courtesy of a larger battery (compared to the S8+) would be extended to the Plus-sized model as well. It’s possible it might not happen, however, and Samsung could just be making sure the smaller of its flagships stop being as limited as they are right now in terms of battery endurance. Nothing’s certain, of course, so we’ll just have to wait and see how much of this particular rumor is based on fact. I think Samsung should launch Active variants in other markets too, they have great potential. Bigger batteries and sturdy hardware are always welcome! I do not care about numbers. Battery in my S8 is way better than in ny old S7. If my phone is working on one charge all day I am happy. Every night I am charging my phone on my wireless charger. Not for me. When I am back to home after work (8am – 5pm) I have +/-60% in my S8 (Spotify + wireless headphones, a lot of websites, FB and one sh!tty game open on every break) . Battery in my S7 was dead before I finish my job, so I can see a HUGE difference. These are ridiculous requests. have you seen a fast charging battery pack of 5000mAh. they’re the same size as an entire phone. you want to fit a phone sized battery into a phone, and still expect it to be slender and desirable form factor?! 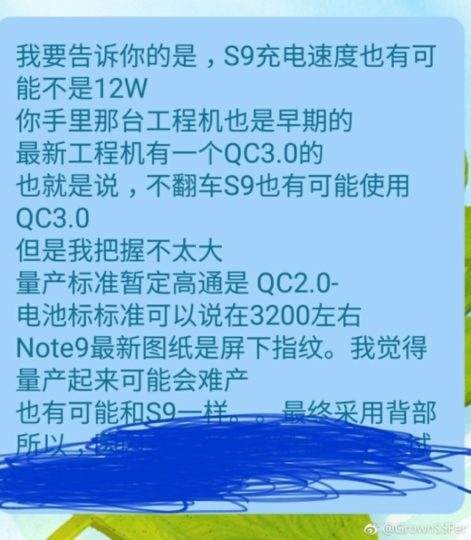 The supposive s9+ is meant to be the one with the extra memory and camera but then again what upgrade does it make over the note 8? To be honest not everyone want a huge phone in their pockets. The s8 size is already at a limit. Making it fatter does make it pocket friendly either especially when most people will be putting a case on it.